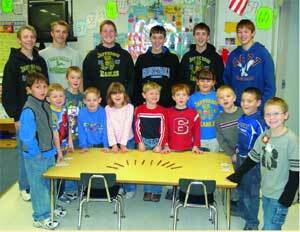 A group of Breckenridge Junior High students are showing wisdom well beyond their ages around the Christmas holidays. BJHS Industrial Arts teacher Steve Toliver, along with Kim Fuller’s Gifted and Talented department implemented a team-teaching project that will help soldiers in the United States military ease their pain of being away from family during Christmas. The project, entitled “The Freedom Pens Project,” was made with the help of Penn State Industries of Philadelphia, Penn, which furnished the 24-carat gold-plated pen kits. The wood used in the making of the pens was Indonesian Rosewood and Brazilian Snakewood. The group constructed pens and then had to write a letter to the men or women receiving the pens telling how their service to our country was appreciated and how thankful they were for the freedoms they have in the United States. 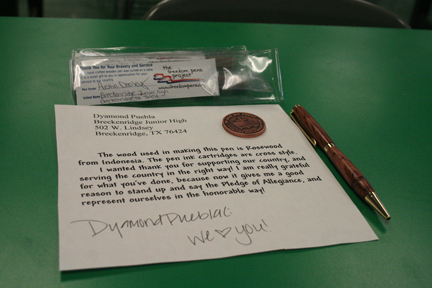 Eighth-grader Dyamond Puebla said the project was an eye-opening experience for her. 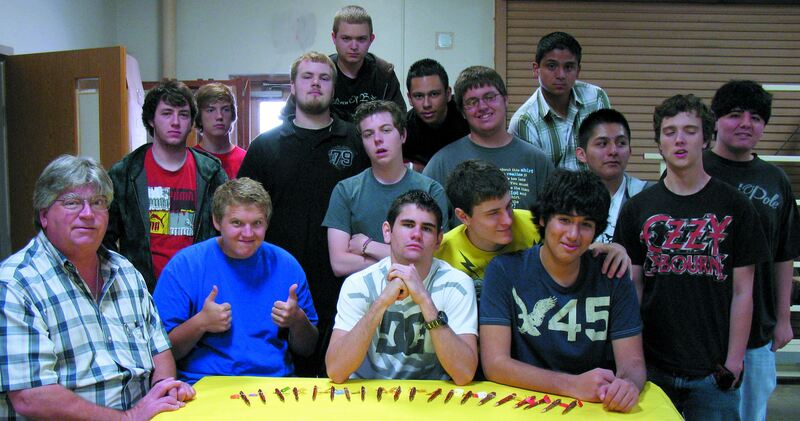 Toliver’s class makes approximately 250 pens a year. Students in BJHS can purchase the pens for use in their classes. However, the 11 pens made from this particular group held a little more meaning. BJHS seventh-grader Tyler Bode, who was working on his fourth pen in the class said the cutting and sanding portion of the project was the most entertaining. 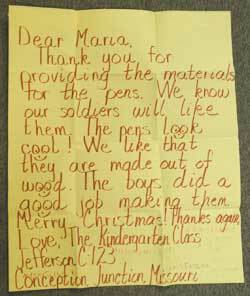 #5705……Pictured are the kids in Steve Toliver’s class as well as Kim Fuller’s Gifted and Talented class who are sending pens and letters to soldiers overseas during Christmas. Students include (front, l to r) Elliott Perez, Tyler Bode, Tiffany Melton, Dyamond Peubla, Morgan Thompson and Maria Mendoza. The back row features (l to r) Blake Martinez, Jake Wallace, Cade Cornett, Kim Fuller, Steve Toliver and Austin Dooley. Not pictured is Jenae Herring. #5707…..Pen Photo: The group will plan to send a group of soldiers a pen, a ‘thank you’ letter along with a coin with an inspirational saying. Hello. And thank you from the 909th FST. I really wanted to send you this thank you, I was really feeling down on this day as i don’t have much family to send me gifts, and being medical i see the sadder side of war. When my Major got and distributed the pens you hand made. I really felt good. I choose a pen that was an alternation of light and dark wood. I really just want you to know, that your hand made gift, has lifted my spirits, and made me feel good that people back home still love and support the troops. I am stationed in Iraq, and I write a letter to my wife every day. I have already written over 150 letters to her during this tour. The pen is awesome, and it will continue to assist ‘written word is true love’ effort that I have been doing during my last three deployments. I received one of your pens today and I just want to Thank you! The care and commitment put into your work shows and is appreciated by all who received your pen here at the Task Force Med/Intensive Care Ward at Bagram AF Afghanistan. 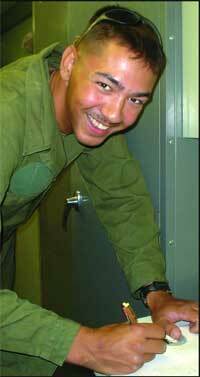 I am currently deployed on the USS Dwight D. Eisenhower in support of Operation Enduring Freedom.We have been gone for three months now and have several more to go. My squadron just received a shipment of your pens today and I wanted to thank you very much for your kind gesture.We love the pens! Thank you SO much for your gift, we received the pens and are distributing. I cannot tell you how touched I was to find out that you do this just for our troops. A friend of mine has a business & he works with wood, he taught me how to make pens & it took me forever and a day to make one pen haha, and by the time I was done, I felt I just had finished my workout because I was tired. So I understand the amount of time & effort that takes to make each one of these unique & beautiful pens. Your gift to us is precious & invaluable, you could be doing things for yourself, and here you are giving your time, talent & resources to us. We truly appreciate it. 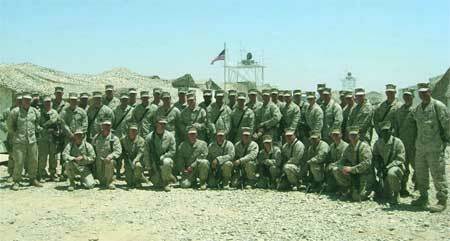 Greetings from Camp Leatherneck, Afghanistan! My name is Lieutenant Elkins. I am a psychologist working at the Combat Stress Clinic here, serving the men and women of the US armed forces. Upon arriving here and entering my new office at the clinic I found a very nice ball point pen with a letter attached to it lying on my desk. It seems that this pen was made by a fine American citizen named James O’Donnell under the sponsorship of a Mr. Burnt. The letterhead read "Davisville Middle School," and so I am writing to you, the principal of Davisville Middle School. First and foremost, please forward my deepest gratitude to James O’Donnell and Mr. Burnt for the gift. It’s a beautiful pen, and writes wonderfully! The gesture was heartwarming, and the words of affirmation are encouraging. Such support goes a long ways here. Second, please let James and Mr. Burnt know that I will place this pen in the reception area of our clinic. 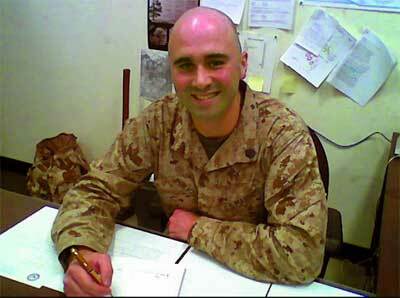 Whenever a service member comes into our clinic for the first time, we have him or her fill out a form.To fill out the form, the service members will be handed James’ pen. Please know that the hands this pen will pass through may very well have come to us directly from the battle field. Typically their hands look tired, crusty, and lifeless. Their hands will likely have just touched the realities of war-wiping sweat off their sunburned faces, grabbing a wounded soldier to carry him to safety, and rubbing away tears.What their hands have not touched for a long time may be the soft hand of a girlfriend, the floppy ears of a pet dog, cool grass while playing a game of football, the gentle skin of a baby born just before they deployed, or the grip of a steering wheel while driving to the drive-thru with their buddies. When they hold James’ pen in their hands covered with the dusty dirt of the desert, they will be feeling these sentiments-these are the feelings of freedom and of home. As a former high school English teacher, I want to thank you, and your staff for taking on the most challenging career in the world-working in education! 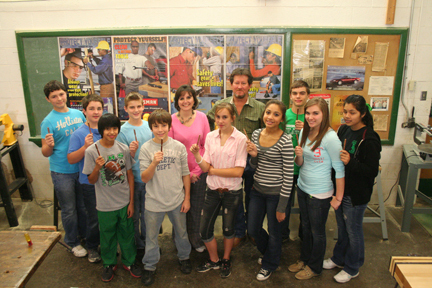 Mr. Stevens’ Advanced Woodworking class at The Colony High School, Colony, Texas, participated in the Freedom Pen Project and really enjoyed the experience. Some turned two or three pens each and were very proud that their work was being sent overseas to our troops. 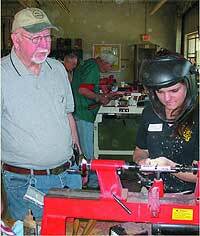 The wood lathe is the most popular machine in the shop for many of his students. program to students at East St. John High School in Reserve, Louisiana. The article about the project was featured in our previous catalogue. Click here to see the previous article. As part of their club’s Youth Outreach endeavors, eleven members of the Bayou Woodturners, a New Orleans area chapter of the American Association of Woodturners, recently conducted a half day demo and hands-on pen turning workshop for students at East St. John High School in the outlying community of Reserve, Louisiana. Developed over several weeks by Rick Myers at the request of the school’s Talented in Visual Arts Department, headed by his wife Carol Jane Myers, the scope quickly grew to include students in other classes, including Wood Shop. Initial planning assessed the Wood Shop’s previously underutilized equipment, tools, supplies, and their condition. 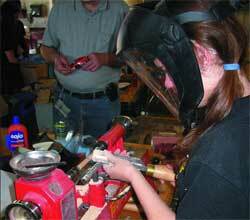 From there, several objectives quickly developed that included: Cover safety, terminology, and other basics with an initial demo and follow with a turning opportunity for approximately thirty 10th – 12th grade students, assisted by experienced woodturners supplying their own lathes and tools for the event. They emphasized the immense variety of items producible on a lathe while starting new turners with a project that an inexperienced person can complete in one session. From tools, equipment, and finishes, including emphasis on the variety of ways available to produce a similar basic end result. Expose potential new turners to the self satisfaction and myriad rewards of transforming somewhat ordinary pieces of wood into eye-popping objects of beauty and utility. 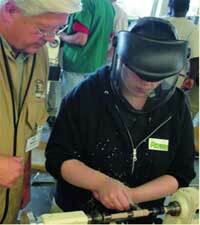 Revive administrators’ interest in woodworking in general, with emphasis on woodturning in particular. Develop processes, lines of communication, and plans for ongoing Youth Outreach support of woodturning at interested schools. Coupled with the Bayou Woodturners’ ongoing contributions to The Freedom Pens Project—a project that to date has supplied over 110,000 custom turned pens at no cost to deployed U.S. armed forces members in appreciation for their service—a pen turning workshop for the students was a natural choice. Prior to the event, the teachers were supplied with the Penn State Industries pen turning instructional DVD, slimline pen assembly instructions, and suggestions for an optional assignment the students could utilize to develop ideas for pen types and shapes. In a last minute surprise, the school’s Principal also invited the entire 9th grade to participate! Considering the logistics of suddenly handling over 150 students, we accommodated the 9th graders as observers only, thus whetting their appetite to participate the next time. Throughout the day of the workshop, in groups of 2 or 3 classes, these 9th graders arrived, each shift spending an hour or more getting their questions answered while viewing the pen turning, sanding, finishing, and assembly activities of their older classmates as well as the variety of turnings on the Instant Gallery table. Through the generosity of participating woodturners, the original 10th – 12th grade students were provided with enough additional materials to produce their first pen for Freedom Pens, a second pen to keep for themselves, and any subsequent pens again for donation to Freedom Pens. As a result, the participating students discovered new abilities in areas of interest that might never have been developed without the exposure from the workshop. Administrators gained insight into the value of a strong woodturning program, including the generous support available from area woodturners. 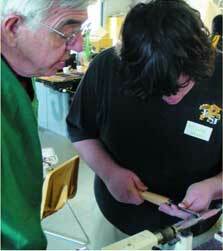 The experienced woodturners had a blast and everyone—students, teachers, and turners–is eager to have another workshop. From experienced woodturners helping students, to students learning to make pens for donation as well as themselves, perhaps the best lesson of the event was discovering the pleasure and satisfaction derived from giving back to your community—especially when you can do it through woodturning. Thank You for the Freedom Pens! Thank you so much for the beautiful pens. All I can say is……WOW! I cannot express my appreciation enough for the support and thoughtfulness. You should be receiving some thanks and hopefully some pictures, I have attached a picture of our Avionics division which we took yesterday, which unfortunately was a day before we received your wonderful gifts. 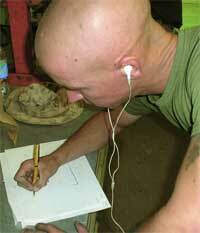 However, I’m sure you will receive some pictures of the Marines using those fine pens also. 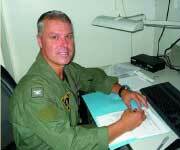 Bob MGySgt R.H. Enfinger Jr.
My name is GySgt Bravo, Lazaro and I’m stationed in Camp Pendleton. I’m the Powerplants Division Chief here in Camp Bastion, Afghanistan. I want to send to you a sincere and heartfelt, thank you for taking the time to think of all of us and the effort you put into making us these pens. We are very appreciative and they will definitely be of very good use here amongst the shop. Again we just want to show our gratitude and let you know the importance of such people as yourselves. We are very grateful for all of your support. Hopefully we don’t scare anybody with our ugly mugs. Thank You from the crew of Powerplants. These photographs were taken while the Freedom Pens were distributed to personnel aboard the aircraft carrier the USS George Washington this past year. Thank you for giving my Exploring industrial Technology Education class the opportunity to support our troops with the Freedom Pen Project. The Freedom Pen Project gave us a chance to do something for others. We started making pens this semester and the students have responded with great enthusiasm, Many want to continue this activity at home and a wood working lathe and pen making equipment is now on their Christmas list. I have given out all of my Penn State Industry catalogs. Thanks again. We will hope to participate again in this project. The freedom pen project was created by the Saw Mill Creek Woodworker’s forum to provide hand made pens for our military stationed in foreign countries. The goal of the project is for every freedom pen to serve as a constant reminder to our troops that they are not alone and that they have our continuing support. Penn State Industries regularly sends Freedom Pens to our troops – Here’s an opportunity for your school to participate in this worthy project. Request your “Freedom Pen” package #FPPROJ with any order of $150 or more. After your pens are completed, mail them back to the Penn State Industries School Division and we will have the pens forwarded to our troops. Instructions for participation are included with the package. This pen was brought to you through a cooperative effort involving Penn State Industries and the Sophomore and Kindergarten Classes of the Jefferson C-123 School District. Penn State Industries provided the materials, the Sophomore Class constructed the pens, and the Kindergarten Class provided the addresses and mailing. Thank you for making this project possible. My class is very excited. The photograph and message above is being inserted into each bag along with the pen. We hope you enjoy our “Thank You” note. The children dictated to me what to write — they organize thoughts better than I do sometimes.